If you're lucky enough to have a gang of kids around on Easter, try these fun egg games for Easter. If you're short on kids, you can ask a few of the neighbor kids to join in, as these games are sure to be a blast. Choose a few games to start and make sure you are prepared with the necessary items before beginning. Let's get the basics out of the way first. Hide the eggs. Either let the smaller children have a head start or have separate hunts for the older and younger kids. Alternately, pair each little child with an adult who has prior knowledge of where the eggs are hidden. Otherwise, the school-age kids will wipe the area clean of eggs before a toddler can even get going. 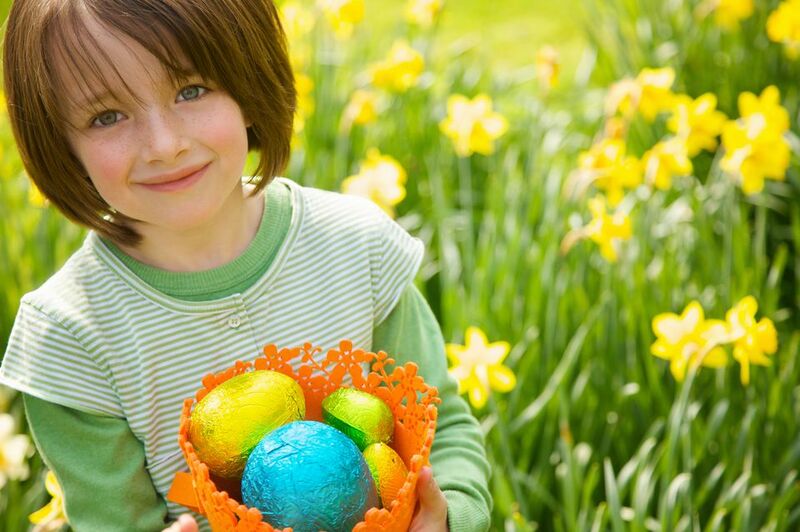 Another way to level the playing field is to buy plastic eggs in a variety of colors, and assign each child a color. The winner can be the person who finds all of his eggs first. Another traditional variation is to have golden eggs with money or gift certificates as special prizes. 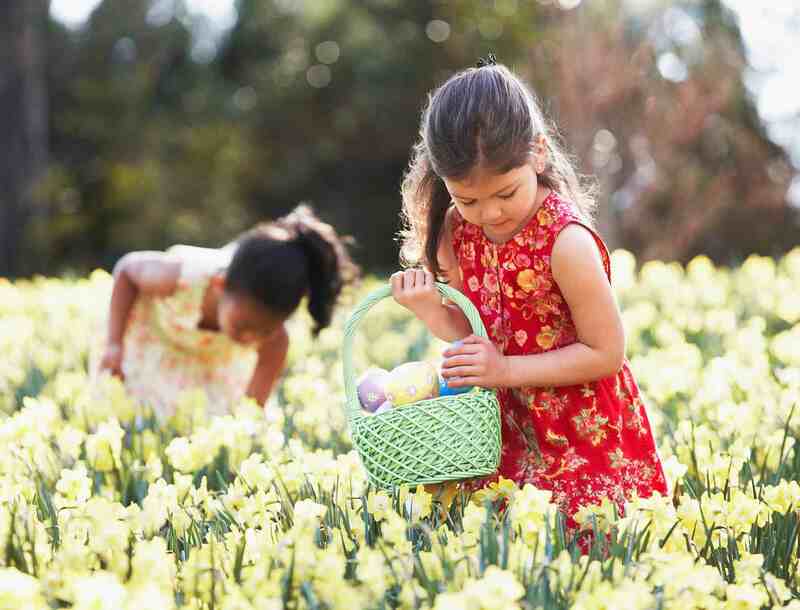 As children get older, they enjoy hiding eggs as well as finding them. If you have quite a few kids, divide them into teams and let them take turns being the egg hiders. Do this with a limited number of eggs, so that they can be found quickly and the hiders can become the hunters. This is a great game for the grown-ups to participate along with the kids. The players are divided into two teams. Each team is divided into two groups, one at Point A, one at Point B. The first player is given an egg in a spoon to carry from Point A to Point B. At that point the egg and spoon are handed off to the next competitor, who carries it back to Point A to the next competitor. A dropped egg means that the person carrying the egg must go back to where he or she started from. Use hard-boiled eggs unless you are willing to sacrifice a couple dozen eggs. If using raw eggs, the person who drops the egg has to go back to the starting point and get another egg. The first team to complete the relay wins. Maybe you can't be at the annual egg roll at the White House, but you can start your own Easter tradition at home. Each child is given a hard-boiled Easter egg. The object is to get it from the starting line to the finish line. There are several ways to roll the egg. The White House version allows the kids to push it with a spoon. An alternative is to push the egg with the feet without cracking the shell. Alternately, the kids can be instructed to get on their hands and knees and push their eggs with their noses. The egg roll can be held outside if the weather is nice, or inside if the weather doesn't co-operate. Turn the egg roll into a relay race if you have lots of participants. One player is the wolf and the others are Easter eggs. Before the game begins, the eggs decide what color they are going to be. Usually, the older kids choose colors with longer names (chartreuse, magenta) and leave the easier colors for the younger kids. The eggs then face the wolf, who begins to guess colors. If the wolf guesses a player's color, that player must step forward one step, spell the color, and then run a predetermined route before running back to the other players, called the "basket." If the egg makes it back to the basket, he chooses a new color, and play continues. If the wolf tags the egg before he gets back to the basket, that player becomes the wolf. This variation on a traditional outdoor game can be played year-round, not just at Easter. This game is played with raw eggs, so if the kids have on their good clothes, you may want to put plastic trash bags over them to protect them. You could play with boiled eggs, but the breaking of the eggs provides most of the fun. Each competitor has a partner. It's good to pair a young kid with an older person. The partners stand about five feet apart, and a raw egg is tossed from one partner to the next. Those who catch the eggs without breaking them continue in the game; the others are out. After each successful catch, the players must take one step backward so that the tosses are longer and longer. The last team left with an unbroken egg wins the game. This game is great fun for family reunions, too. This activity should be held separately from any other Easter hunt and must be prepared ahead of time. The person in charge of the hunt creates a series of hints that will lead the children from one site to another until the final prize is found. The hints are placed inside plastic Easter eggs, and the kids are given the first one to start off the fun. Write the clues in rhyme or make the clues a little bit hard to figure out. For example, for older children, one might clue an egg hidden in a grandfather clock by saying, "I'm a grandfather who might get 'ticked' at you." For younger children, you might say, "I'm a clock, taller than wide. Find the next clue, by looking inside." Put the final prize inside a golden egg or a fancy egg. A little cache of toys or candy can form the "treasure." If you need more ideas for hiding places and clues, check out clues for an indoor treasure hunt and clues for an outdoor treasure hunt. This game requires two teams and a referee. Grown-ups can play with the kids. Team members are numbered, so that each team has a number one, number two, etc. The teams line up opposite each other, and a plastic Easter egg is placed in the middle. The referee calls out a number, and the two players with that number approach the middle of the field. The object is to pick up the egg and get back to your line without being tagged by the other player. If a player succeeds in doing so, his or her team gets a point. If the player is tagged, the other team gets a point. Ten points win the game. A player can be tagged only after picking up the egg, so the strategy is important. Is it best to go for the egg, or wait for the other person to pick it up? This game is a variation of Hot Potato, which is a variation of musical chairs. Fill a plastic egg with something to give it a little weight. Tape it closed very securely. Players sit or stand in a circle. When the music starts, the players pass the "hot boiled egg" around the circle. When the music stops, the person left holding the egg is out. Play continues until only one person is left, and that person is the winner. This game is played similarly to bocce or lawn bowling. It can be played indoors or out. Each player uses a colored boiled egg. A plain white boiled egg is used as the target. Players compete to see who can roll their egg closest to the white egg without touching it. The first person to win a certain number of rounds—usually, five or ten— will win the game.